While I was born in the 50’s my musical birth was the 70’s; and by the time I’d bought my first record a lot of music had already gone under the metaphorical bridge; so. I can only guess at how exciting it must have been for ears brought up on Big Bands to hear Tutti Frutti, Rip It Up, Lucille and Bama Lama Bama Loo for the very first time. Thankfully for youngsters of my generation there is an excellent booklet accompanying the three albums that spans 9 amazing years from 1956 to 1965 as it joins the dots of Little Richards early career and why things changed so dramatically once the Beatles arrived in the USA and Soul music under the tutelage of Stax, Motown and Atlantic became commercial. Album #1 opens with a beautiful Gospel tinged song, called Lonesome and Blue and leads us into another 6 songs that straddle R&B and what would become Soul. 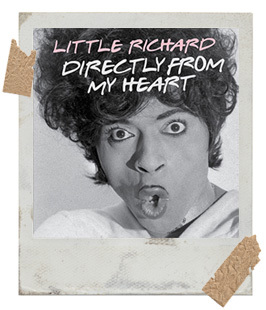 Perhaps it was the production; but I had no idea Little Richard was something of a crooner; but when we get to track #8 Tutti Frutti music and history changes in three short minutes. Nearly 60 years after it was first recorded Tutti Frutti still sounds exciting, rude and indeed ‘fresh.’ Hands up who thinks the same will be said of 1 Direction songs in 2075. All of the classics are here and every single one of them had my toes tapping and brought a smile to my face. Alongside plenty of songs that were ‘of their time’ I’ve also discovered a few gems tucked away too; like Can’t Believe You Want To Leave must have been on the young James Brown’s turntable non-stop before he went into a recording studio. Then on I’ll Never Let You Go (Boo Hoo Hoo) Richard appears to take a Fats Domino tune and set fire to it as the singer rattles his piano alongside a fabulous horn section creating the great lost Rock n Roll song. This triple album box-set goes someway to recreate the magical times of early Rock and Roll; but the inclusion of numerous B-Sides, weak cover versions and what are termed ‘rarities’ 84 tracks makes for a long old haul. Especially as the very, very best could easily have been edited into a brilliant single, 20 track CD that would really show what a talent Little Richard was. I know that’s what I’ve done!